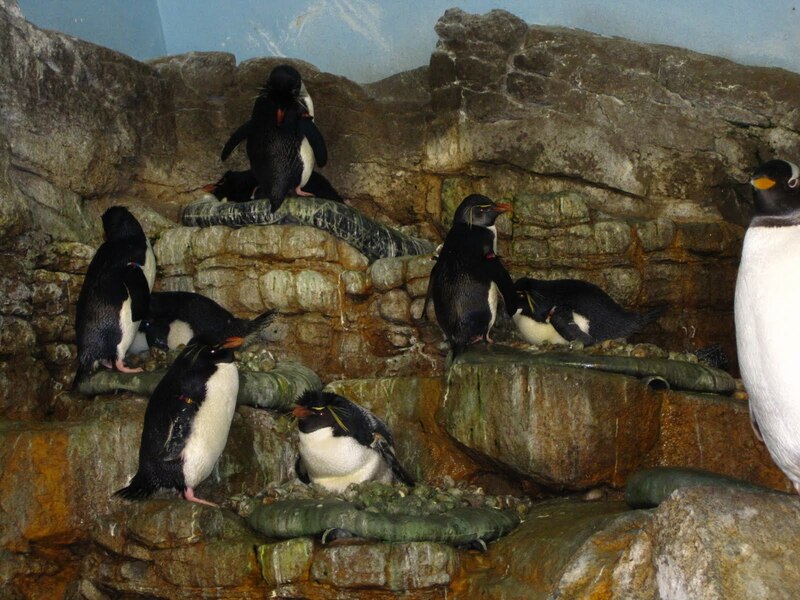 Up until recently our rockhopper population has been mostly males. In an attempt to even out our gender ratio and help increase our chance of breeding in the future, we acquired seven female southern rockhoppers from SeaWorld in Orlando. 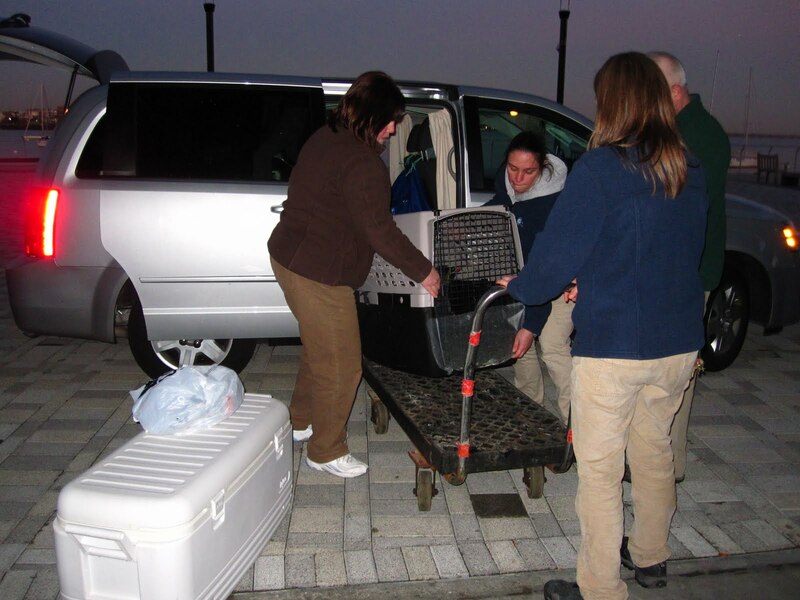 Trading among aquariums and zoos for breeding purposes in not uncommon (we mentioned this briefly in a previous post about SSPs), but the transport of these penguins to Boston certainly was quite unique. We drove the penguins from Orlando up to Boston! 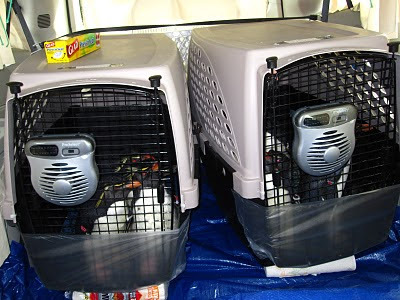 In November of 2009 Heather and I flew down to Orlando. 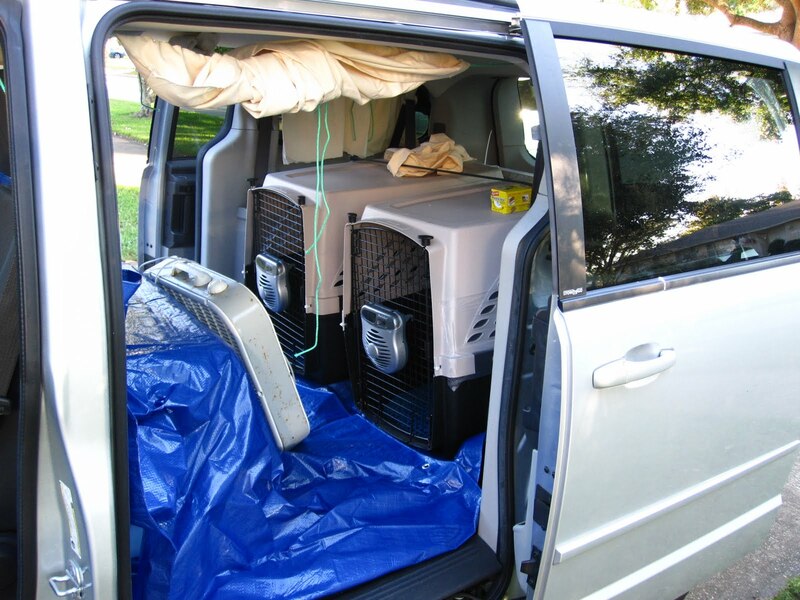 We spent a few days setting a rental minivan up for the transport. We secured large dog crates to the floor of the van (stow-and-go seats were very useful); we covered everything with tarps to make sure no guano (penguin poop) got on the carpet. We even made little curtains for the windows to keep the hot sun off the crates containing the penguins. In addition to preparing the van for the transport I got a chance to shadow the SeaWorld penguin staff for 2 days. 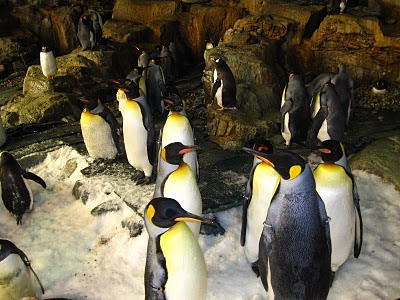 It was a great experience to get to see the similarities and differences between the NEAq and other institutions. At the SeaWorld penguin encounter, they have over 200 penguins including rockhoppers, king penguins, gentoos and adelie penguins. I got the chance to work with 3 new species of penguins, in a behind-glass" exhibit filled with snow! Then it was time to start the drive. 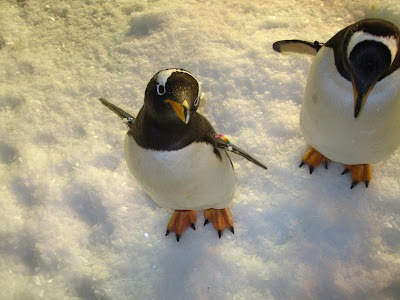 We secured the rockhoppers in the van and started driving north very early in the morning. 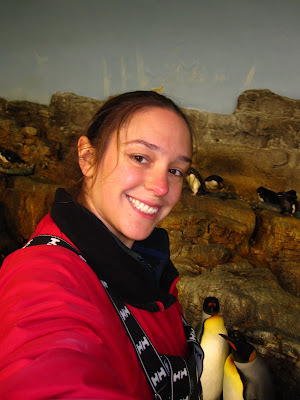 Heather and I took turns driving, and stopped to feed ourselves and the penguins. We stopped in Virginia for the night and stayed in a pet friendly hotel. Then we got up early to finish the second leg of drive. 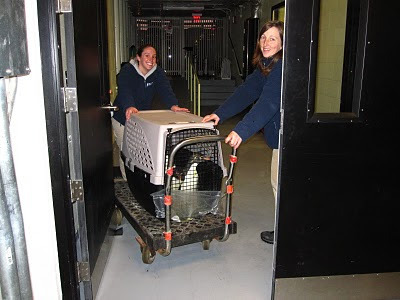 Luckily the weather was beautiful and we didn’t hit any traffic and we arrived in Boston early in the evening on the second day, with the rest of the staff and some volunteers anxiously awaiting our arrival. 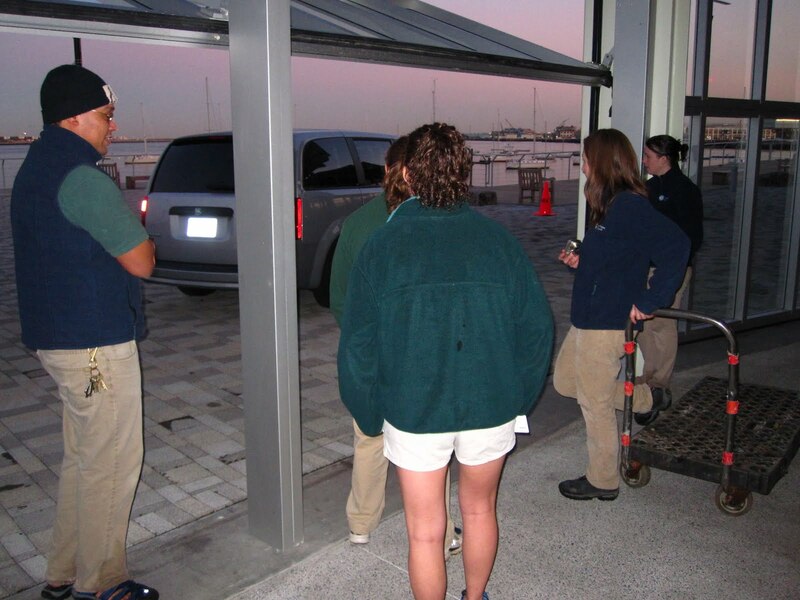 Aquarium staff and volunteers await our arrival. 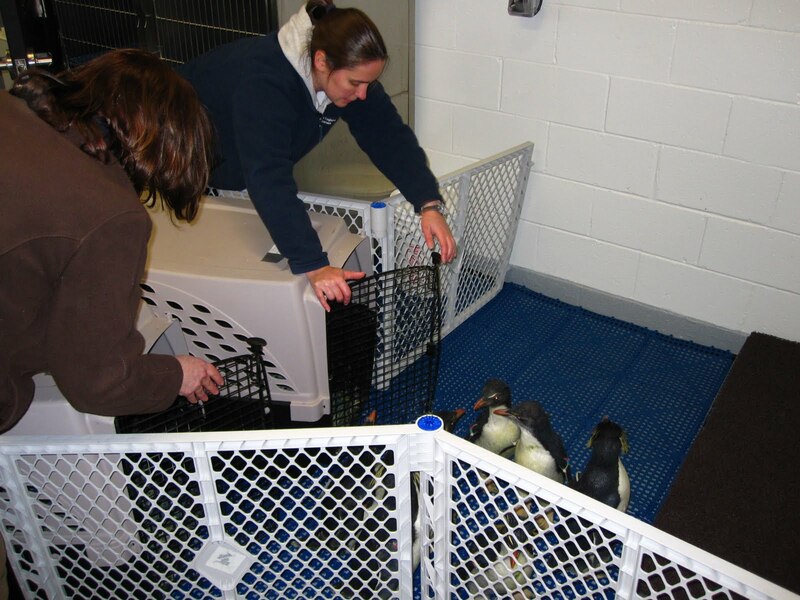 We unloaded the van, and settled the rockhoppers in a behind the scenes quarantine area where they would stay for 30 days to ensure they were healthy before being introduced to our resident penguins and their exhibit. It was a long couple of days but it was a great experience. I think my favorite memory from the trip was when we had just crossed into Massachusetts and the band Journey came on my iPod. 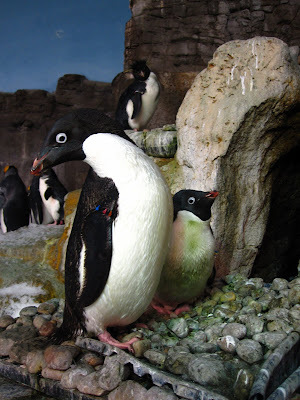 The rockhoppers just started vocalizing like crazy, they didn’t react this way to any of the other bands we listened to over the past two days, and it was so funny. They must have really wanted to hear a little Journey to finish up their journey to Boston. In this clip you can hear Journey playing on the radio and then the rockhoppers singing along.